Processed audio tracks can be exported as audio files from Revoice Pro. If necessary these can then be loaded into a DAW. 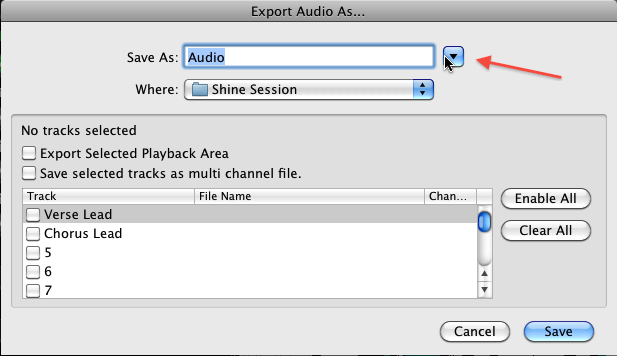 Revoice Pro tracks are automatically named when exporting. 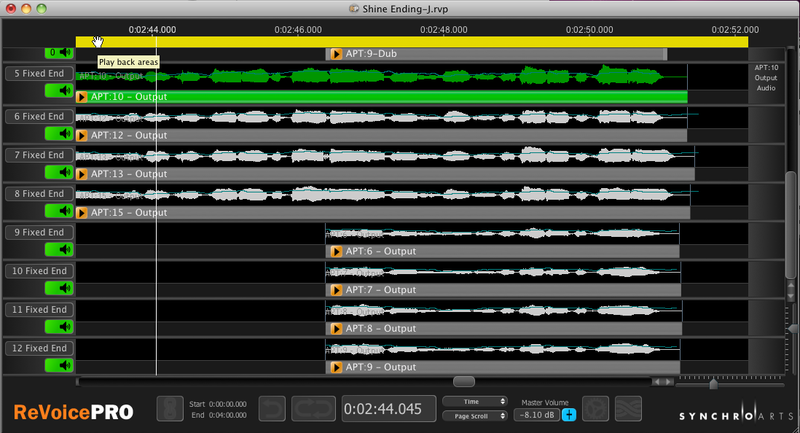 Entire tracks can be selected, or the start and stop area exported can be defined by setting a Playback Range. Multiple exported files can be dragged together to the DAW at one time. Most DAWs will place each dragged Revoice Pro track into one of the DAW's tracks. If these tracks are NOT initially at the correct timecode when dragged in, a single command in the DAW will usually be sufficient to place each imported audio track at the correct timecode. 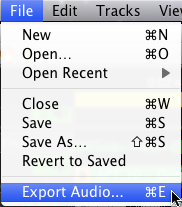 When ready to export audio from Revoice Pro, select the File menu in Revoice Pro and select Export Audio as shown in the Mac menu (left) or Windows menu (right). Alternatively use CMD E (Mac) / Ctrl E (Windows). Either the small or extended version of the Export Audio As... window will appear with the small version shown directly below. Clicking the control indicated by the red arrow will switch the view from the small to the extend version shown in the next picture, and vice versa. 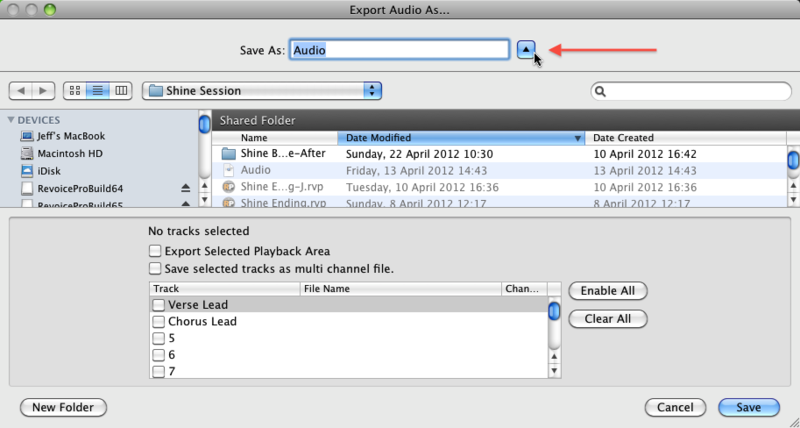 The extended version of the Export Audio window shown below allows more options for finding folders and devices and displaying file information. For the rest of this example, we will show how to export a selection of tracks from the Revoice Pro Session shown below where the last 8 tracks of the session are visible. With the above session, when Export Audio is selected, the (small) Export Audio As ... window similar to that shown right will appear. Note that no tracks or options are selected yet. The destination folder is shown as "Shine Session". This can be changed as appropriate. We will next look at track selection and the auto file naming system. In the picture below, we have selected tracks 8,9,10 and 12. The names of the files that will be created are shown in the "File Name" column. 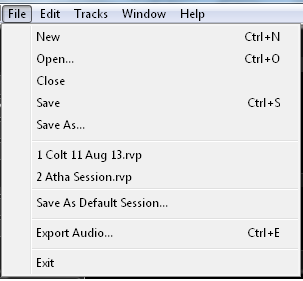 These have been automatically named by combining the Track Name and the default Save As: prefix name "Audio". In addition, the number of channels contained in each file is shown. We can make the name of the file more relevant by changing the "Prefix" name in the Save As window. 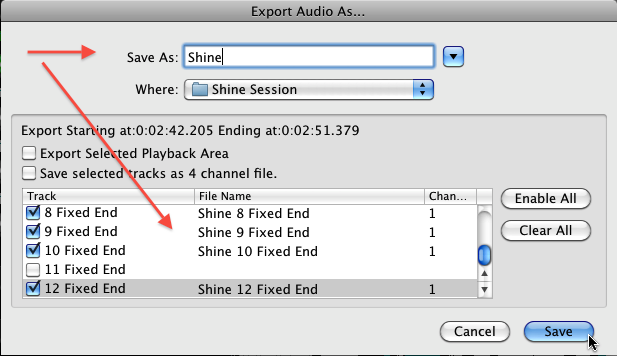 In this case, we have changed it to "Shine" and the Files names are automatically changed to include this prefix as well. 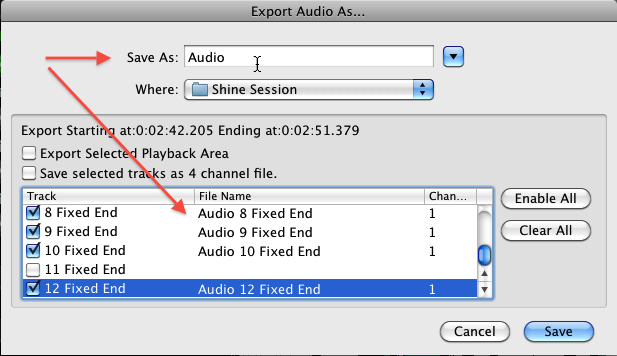 Note that the option "Export Selected Playback Area" is NOT checked, so all of the audio in the selected tracks will be exported. The time range of export is shown following the "Export Starting at ...." message. When all the options and file names are set as required, click SAVE. The named audio files will be saved into the directory shown in the "Where" window. Go to the directory you selected for the output, and drag ALL the files exported from Revoice Pro to the desired destination tracks in the main editing window of your DAW.